Most devices respond to a single type of IR signal in order to understand the commands that are being sent from your remote - this is referred to as the "IR language" for that device. Some devices support multiple IR languages meaning there are two or more different ways to send any given command - this is referred to as having "multiple device versions". Harmony will automatically try to send the most common IR language/device version; however if your device is set to one of the others, Harmony will have to learn which is the proper IR language/device version to send. If your device has multiple device versions then myharmony.com should display an information (i) icon above the device. We recommend you click on Show Details to see instructions specific to your device. (recommended) Some devices can switch their IR language/device version from a settings menu or a physical switch on the back of the device. 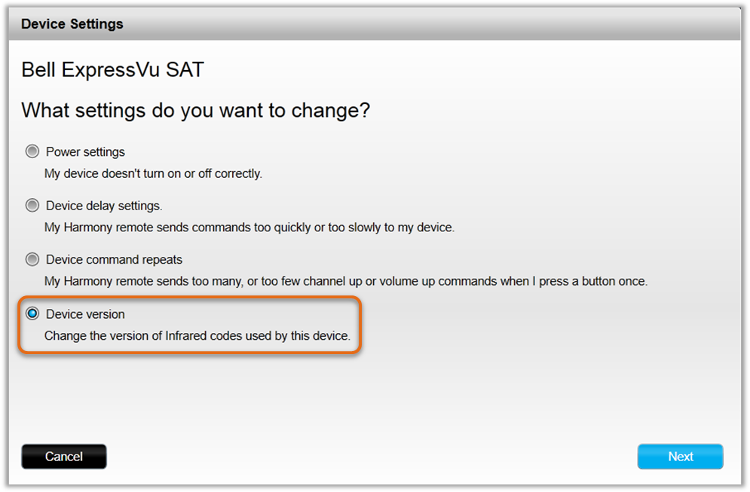 Other devices cannot switch their IR language/device version and you must teach a command from your original manufacturer's remote so Harmony may learn what to send. Select the device for which you would like to change the IR language/device version. The Device Versions menu item will only appear if your device has multiple IR languages/device versions. If this menu does not appear then this may not be a device with multiple IR languages/device versions. You may still teach Harmony any required commands. 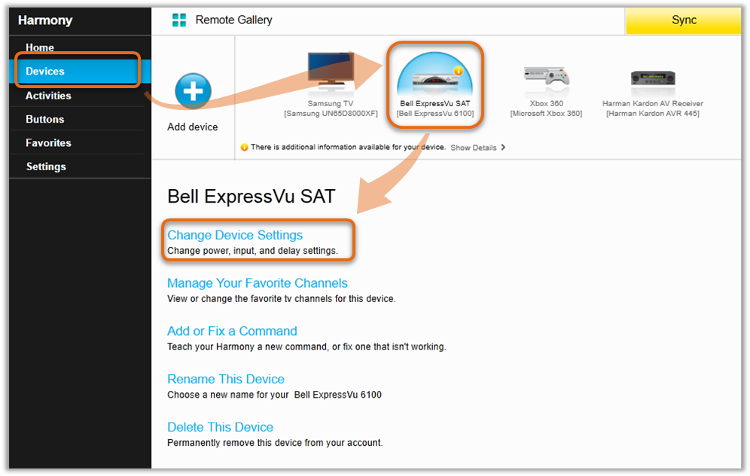 Refer to this support article: Add or fix a command on your Harmony Remote. In order for Harmony to learn which of the other IR languages/device versions your device uses, you must teach a command from the original, manufacturer's remote. Select Yes to proceed. 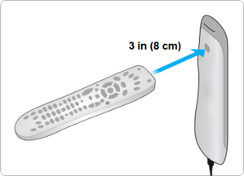 Using the USB cable that came with your Harmony remote, connect it to your computer. Harmony 600/650/700 remotes connect from the top of the remote. Harmony Ultimate, Ultimate One and Touch remotes connect from the bottom of the remote. Do not use the charging cradle. Harmony Smart Control and Harmony Hubs connect using the hub itself, located on the back. 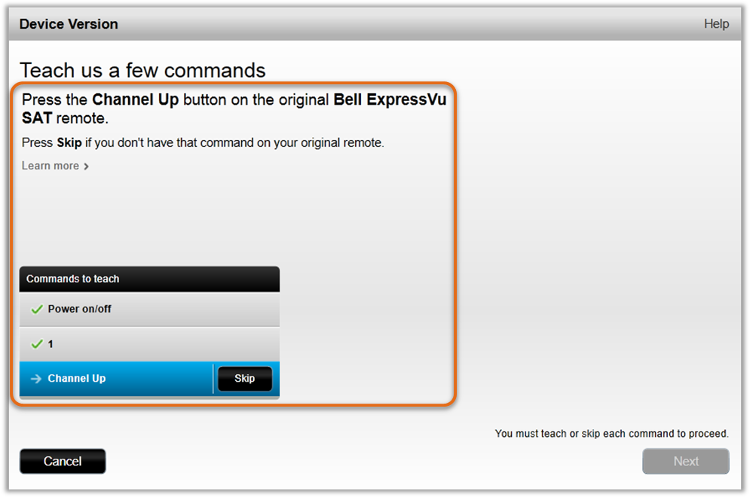 View additional support information if your remote or hub is not being detected. 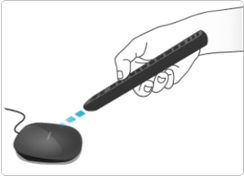 Point the tip of your devices original remote control at the IR input sensor on your Harmony remote or hub as instructed by the screen animation. 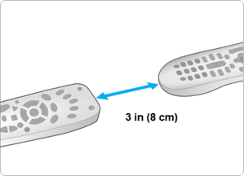 The remotes should be approximately 3 inches (8 cm) apart. The Harmony 600/650/700 IR input sensor is located at the top of the Harmony remote. The Harmony Touch & Harmony Ultimate IR input sensor is on the back. The Harmony Hub IR input sensor is on the front/ top. You will be instructed to teach up to 3 commands from your original, manufacturer's remote control. Hold the button on your original remote for 1 to 2 seconds. Once complete, Harmony will now know which IR language your device responds to and will send that device version.